The Flower Preservation Studio offers a nationwide bouquet preservation service. This means that no matter where you are in the UK, you can still have your special flowers preserved and framed by us for years to come ! Getting Your Flowers To Us is Really EASY. Option 1 - If you are near our studio in Wimborne, Dorset then you are more than welcome to bring your flowers to us yourself. Please remember to phone first before setting off to ensure that we have availability to fit you in. Option 2 - If it is not possible for you to drop the flowers off to us and you live within our local collection area (within 10 miles radius of our Studio), then one of our team can personally collect your flowers for a small additional fee. Option 3 - If you live outside of our local collection area, we can arrange for your flowers to be collected by secure courier. 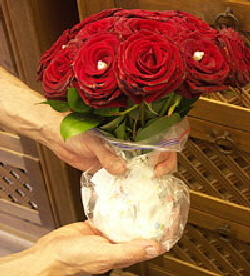 We will tell you exactly how to pack your flowers so that they do not get damaged. This service will usually cost around £35 depending on where you are. Option 4 - The best option! If you cannot wait in for a courier to collect or would like to avoid the courier charge, then all you need to do is to take your flowers to your local post office as soon as possible after your event and send them to us by Royal Mail Special Delivery. Again, please ensure that you telephone us first before sending your flowers. Please do not be concerned about sending your flowers to us with Royal Mail. We have found that Royal Mail Special Delivery is by far the most efficient and reliable method of getting flowers to us quickly and in one piece. Parcels sent by Royal Mail Special Delivery are guaranteed to be delivered to us by 1pm the next working day and for your peace of mind, all parcels are fully trackable online. 1. 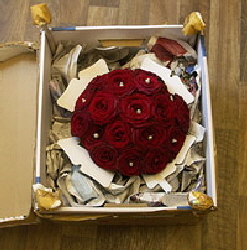 You will need a sturdy cardboard box either with a lid or one with flaps that can be sealed to put your flowers in. This should be large enough to comfortably accommodate your flowers. You may if you wish strengthen the corners of the box using lengths of dowel but this is not essential. Ideally, the flowers need to be placed upright in the box to avoid putting unnecessary pressure on the flowers - a cardboard florist’s vase or something similar will support the flowers very nicely. If you don’t have a cardboard florist’s vase to hand, don’t worry. You can improvise using an old jam jar or glass. Remember, the vase or jar is only meant to support the flowers upright in the box whilst you fill in the void around the flowers with your packaging material. 2. If sending a hand-tied bouquet, soak a few sheets of kitchen roll with water and wrap around the stems. Than place a small plastic food bag or similar around the stems of the flowers and the kitchen roll (but not around the flowers) to help with moisture retention whilst the flowers are in transit. If you are sending a shower type bouquet, if the flowers are pushed into green oasis, please top up the oasis with some more water before packing. 3. Make a nest in the bottom of the box with long shredded paper and/or crumpled tissue paper and/or crumpled up newspaper and/or crumpled up magazine paper and/or kitchen roll and place the bouquet and vase/jar in the nest with the flowers facing upwards. NEVER use plastic or bubble wrap over the top of your flowers as this will make your flowers hot and sweaty and encourage bacteria growth. 4. Please fill in around the bouquet to the top of the box in order to minimize movement of the bouquet during its journey. Make sure you do not crush or bruise your flowers in the process and do not put anything heavy inside the box that could damage your flowers. 5. Please write your name and wedding date on a piece of paper and attach it to the inside of the box with tape. This is very important otherwise we will not know who the bouquet belongs to. If we have not already received your deposit, please include a cheque for £150 made payable to The Flower Preservation Studio Ltd and place it in an envelope again taped to the inside of the box. 6. 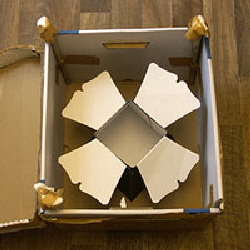 Close and seal the box with heavy duty tape – cellotape is not strong enough. 7. Clearly write our details on the top of the box. The Flower Preservation Studio, Elm Grove, Blandford Road, Hillbutts, Wimborne, Dorset, BH21 4DS. 8. 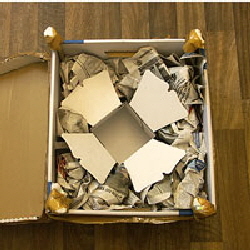 Write in large letters “FRAGILE – FRESH FLOWERS” and “THIS WAY UP” with arrows pointing up towards the top of the box. 9. We will arrange for your flowers to be collected by secure courier. 10. If you are sending the flowers to us yourself, please take your parcel to your local Post Office and ask for the parcel to be sent to us at the above address by Royal Mail Special Delivery Before 1pm Service. The cost for this service is usually around £11 to £15 depending on the weight/size of your parcel. Remember to get a receipt and consignment number so that you can track the parcel online if you want. Please do not hesitate to contact us on 01202 848801 if you need any help with the packaging of your flowers or if you have any questions about getting your flowers to us.